Pressey opened his run with a 12-point, 11-assist double-double vs. previously undefeated Illinois in the Bud Light Braggin’ Rights game in St. Louis and then recorded the first 19-point, 19-assist game in basketball (college or NBA) since John Stockton with the Utah Jazz during the 1990-91 season. Pressey enjoyed that 19-19 game at UCLA and broke the Pauley Pavilion record in the process. The 19 assists were also the most in college basketball since 2008 and the most by a major college performer since 2000. Pressey then scored a career high 26 points on Jan. 5 to lead the Tigers to a win over Bucknell (also named SEC Player of the Week) and recently scored 11 points and dished 13 assists to top Alabama in the SEC-opener. Those 13 dimes tied the Mizzou Arena record. Over his last four games Pressey has logged three point-assist double-doubles and is averaging 17.0 points and 12.0 assists. His 7.6 assists per game are the most in school history and rank No. 6 nationally. 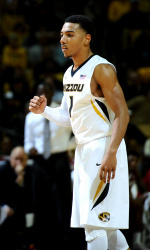 Missouri Basketball returns to action on Saturday night at Ole Miss. Game time is scheduled for 7 p.m. in Oxford, Miss., and the game will be televised live on FSN.